For the bird, see Prion (bird). For the theoretical subatomic particle, see Preon. Prions are misfolded proteins which characterize several fatal neurodegenerative diseases in humans and many other animals. It is not known what causes the normal protein to misfold; the abnormal three-dimensional structure is suspected of conferring infectious properties. The word prion derives from "proteinaceous infectious particle". Prions composed of the prion protein (PrP) are hypothesized as the cause of transmissible spongiform encephalopathies (TSEs), including scrapie in sheep, chronic wasting disease (CWD) in deer, bovine spongiform encephalopathy (BSE) in cattle (commonly known as "mad cow disease"), and Creutzfeldt-Jakob disease (CJD) in humans. In humans, prions are believed to be the cause of Creutzfeldt–Jakob disease (CJD), its variant (vCJD), Gerstmann–Sträussler–Scheinker syndrome, fatal familial insomnia and kuru. All known prion diseases in mammals affect the structure of the brain or other neural tissue; all are progressive, have no known effective treatment and are always fatal. A prion disease is a proteopathy, other proteopathies include multiple system atrophy (MSA), a rare human neurodegenerative disease, features a misfolded version of a protein called alpha-synuclein. There is also evidence suggesting prions may play a part in the process of Alzheimer’s disease, and Parkinson's disease, and these have been termed prion-like diseases. Several yeast proteins have also been identified as having prionogenic properties. The hypothesized role of a protein as an infectious agent stands in contrast to all other known infectious agents such as viruses, bacteria, fungi and parasites, all of which contain nucleic acids (DNA, RNA or both). Synthetic prions, created in the laboratory independent of any biological source, have little or no ability to cause infection with TSEs. However, when synthetic prions are administered in combination with cofactors, such as phosphatidylethanolamine and RNA molecules, then this can transmit TSEs. Several scientific observations remain unexplained by the prion hypothesis: It is known that mice with severe combined immunodeficiency do not develop scrapie following inoculation with brain tissue from animals infected with scrapie, suggesting that either the role of immunity in prion pathogenesis is incompletely understood or that there is some other flaw in current understanding of prion pathophysiology. More recently, it has been shown that scrapie and Creutzfeldt–Jakob disease may require agent-specific nucleic acids for transmission of infection. For these reasons, the prion/TSE hypothesis incompletely accounts for the observed data. Prion aggregates are stable, accumulate in infected tissue and are associated with tissue damage and cell death. This structural stability means that prions are resistant to denaturation by chemical and physical agents, making disposal and containment of these particles difficult. Prion structure varies slightly between species, but nonetheless prion replication is subject to epimutation and natural selection just like other forms of replication. During the 1960s, two London-based researchers, radiation biologist Tikvah Alper and biophysicist John Stanley Griffith, developed the hypothesis that the transmissible spongiform encephalopathies are caused by an infectious agent consisting solely of proteins. Earlier investigations by E.J. Field into scrapie and kuru had found evidence for the transfer of pathologically inert polysaccharides that only become infectious post-transfer, in the new host. Alper and Griffith wanted to account for the discovery that the mysterious infectious agent causing the diseases scrapie and Creutzfeldt–Jakob disease resisted ionizing radiation. (A single ionizing "hit" normally destroys an entire infectious particle, and the dose needed to hit half the particles depends on the size of the particles. Empirical results of ionizing doses applied to the unknown infectious substance evidenced an infectious particle size too small to be a viral mechanism.) In his paper, entitled "Does the agent of Scrapie replicate without nucleic acid", Griffith proposed three ways in which a protein could be a pathogen. In the first hypothesis, he suggested that if the protein is the product of a normally suppressed gene, and introducing the protein could induce the gene's expression, that is, wake the dormant gene up, then the result would be a process indistinguishable from replication, as the gene's expression would produce the protein, which would then go wake the gene up in other cells. His second hypothesis forms the basis of the modern Prion theory, and proposed that an abnormal form of a cellular protein can convert normal proteins of the same type into its abnormal form, thus leading to replication. His third hypothesis proposed that the agent could be an antibody if the antibody was its own target antigen, as such an antibody would result in more and more antibody being produced against itself. However, Griffith acknowledged that this third hypothesis was unlikely to be true due to the lack of a detectable immune response. Francis Crick recognized the potential significance of the Griffith protein-only hypothesis for scrapie propagation in the second edition of his "Central dogma of molecular biology" (1970): While asserting that the flow of sequence information from protein to protein, or from protein to RNA and DNA was "precluded", he noted that Griffith's hypothesis was a potential contradiction (although it was not so promoted by Griffith). The revised hypothesis was later formulated, in part, to accommodate reverse transcription (which both Howard Temin and David Baltimore discovered in 1970). In 1982, Stanley B. Prusiner of the University of California, San Francisco announced that his team had purified the hypothetical infectious protein, which did not appear to be present in healthy hosts, though they did not manage to isolate the protein until two years after Prusiner's announcement. The protein was named a prion, for "Proteinacious infectious particle", taken from the words protein and infection. When the prion was discovered, Griffith's first hypothesis, that the protein was the product of a normally silent gene was favored by many. It was subsequently discovered, however, that the same protein exists in normal hosts but in different form. Following the discovery of the same protein in different form in uninfected individuals, the specific protein that the prion was composed of was named the Prion Protein (PrP), and Griffith's second hypothesis that an abnormal form of a host protein can convert other proteins of the same type into its abnormal form, became the dominant theory. Prusiner won the Nobel Prize in Physiology or Medicine in 1997 for his research into prions. The protein that prions are made of (PrP) is found throughout the body, even in healthy people and animals. However, PrP found in infectious material has a different structure and is resistant to proteases, the enzymes in the body that can normally break down proteins. The normal form of the protein is called PrPC, while the infectious form is called PrPSc – the C refers to 'cellular' PrP, while the Sc refers to 'scrapie', the prototypic prion disease, occurring in sheep. While PrPC is structurally well-defined, PrPSc is certainly polydisperse and defined at a relatively poor level. PrP can be induced to fold into other more-or-less well-defined isoforms in vitro, and their relationship to the form(s) that are pathogenic in vivo is not yet clear. PrPC is a normal protein found on the membranes of cells. It has 209 amino acids (in humans), one disulfide bond, a molecular mass of 35–36 kDa and a mainly alpha-helical structure. Several topological forms exist; one cell surface form anchored via glycolipid and two transmembrane forms. The normal protein is not sedimentable; meaning that it cannot be separated by centrifuging techniques. Its function is a complex issue that continues to be investigated. PrPC binds copper (II) ions with high affinity. The significance of this finding is not clear, but it is presumed to relate to PrP structure or function. PrPC is readily digested by proteinase K and can be liberated from the cell surface in vitro by the enzyme phosphoinositide phospholipase C (PI-PLC), which cleaves the glycophosphatidylinositol (GPI) glycolipid anchor. PrP has been reported to play important roles in cell-cell adhesion and intracellular signaling in vivo, and may therefore be involved in cell-cell communication in the brain. Protease-resistant PrPSc-like protein (PrPres) is an isoform of PrPc which is structurally altered and converted into a misfolded proteinase K-resistant form in vitro. To model conversion of PrPC to PrPSc in vitro, Saborio et al. rapidly converted PrPC into a PrPres by a procedure involving cyclic amplification of protein misfolding. The term "PrPres" has been made to distinguish between PrPSc, which is isolated from infectious tissue and associated with the transmissible spongiform encephalopathy agent. For example, unlike PrPSc, PrPres may not necessarily be infectious. The infectious isoform of PrP, known as PrPSc, is able to convert normal PrPC proteins into the infectious isoform by changing their conformation, or shape; this, in turn, alters the way the proteins interconnect. PrPSc always causes prion disease. Although the exact 3D structure of PrPSc is not known, it has a higher proportion of β-sheet structure in place of the normal α-helix structure. Aggregations of these abnormal isoforms form highly structured amyloid fibers, which accumulate to form plaques. It is unclear as to whether these aggregates are the cause of cell damage or are simply a side-effect of the underlying disease process. The end of each fiber acts as a template onto which free protein molecules may attach, allowing the fiber to grow. Under most circumstances, only PrP molecules with an identical amino acid sequence to the infectious PrPSc are incorporated into the growing fiber. However, rare cross-species transmission is also possible. The physiological function of the prion protein remains poorly understood. While data from in vitro experiments suggest many dissimilar roles, studies on PrP knockout mice have provided only limited information because these animals exhibit only minor abnormalities. In research done in mice, it was found that the cleavage of PrP proteins in peripheral nerves causes the activation of myelin repair in Schwann cells and that the lack of PrP proteins caused demyelination in those cells. MAVS, RIPI, and RIP3 are prion-like proteins found in other parts of the body. They also polymerise into filamentous amyloid fibers which initiate regulated cell death in the case of a viral infection to prevent the spread of virions to other, surrounding cells. A review of evidence in 2005 suggested that PrP may have a normal function in maintenance of long-term memory. As well, a 2004 study found that mice lacking genes for normal cellular PrP protein show altered hippocampal long-term potentiation. A recent study that might explain why this is found that neuronal protein CPEB has a similar genetic sequence to yeast prion proteins. The prion-like formation of CPEB is essential for maintaining long-term synaptic changes associated with long term memory formation. A 2006 article from the Whitehead Institute for Biomedical Research indicates that PrP expression on stem cells is necessary for an organism's self-renewal of bone marrow. The study showed that all long-term hematopoietic stem cells express PrP on their cell membrane and that hematopoietic tissues with PrP-null stem cells exhibit increased sensitivity to cell depletion. Fibril model of prion propagation. The first hypothesis that tried to explain how prions replicate in a protein-only manner was the heterodimer model. This model assumed that a single PrPSc molecule binds to a single PrPC molecule and catalyzes its conversion into PrPSc. The two PrPSc molecules then come apart and can go on to convert more PrPC. However, a model of prion replication must explain both how prions propagate, and why their spontaneous appearance is so rare. Manfred Eigen showed that the heterodimer model requires PrPSc to be an extraordinarily effective catalyst, increasing the rate of the conversion reaction by a factor of around 1015. This problem does not arise if PrPSc exists only in aggregated forms such as amyloid, where cooperativity may act as a barrier to spontaneous conversion. What is more, despite considerable effort, infectious monomeric PrPSc has never been isolated. An alternative model assumes that PrPSc exists only as fibrils, and that fibril ends bind PrPC and convert it into PrPSc. If this were all, then the quantity of prions would increase linearly, forming ever longer fibrils. But exponential growth of both PrPSc and of the quantity of infectious particles is observed during prion disease. This can be explained by taking into account fibril breakage. A mathematical solution for the exponential growth rate resulting from the combination of fibril growth and fibril breakage has been found. The exponential growth rate depends largely on the square root of the PrPC concentration. The incubation period is determined by the exponential growth rate, and in vivo data on prion diseases in transgenic mice match this prediction. The same square root dependence is also seen in vitro in experiments with a variety of different amyloid proteins. The mechanism of prion replication has implications for designing drugs. Since the incubation period of prion diseases is so long, an effective drug does not need to eliminate all prions, but simply needs to slow down the rate of exponential growth. Models predict that the most effective way to achieve this, using a drug with the lowest possible dose, is to find a drug that binds to fibril ends and blocks them from growing any further. Until 2015 all known mammalian prion diseases were considered to be caused by the prion protein, PrP; in 2015 multiple system atrophy was found to be transmissible and was hypothesized to be caused by a new prion, the misfolded form of a protein called alpha-synuclein. The endogenous, properly folded form of the prion protein is denoted PrPC (for Common or Cellular), whereas the disease-linked, misfolded form is denoted PrPSc (for Scrapie), after one of the diseases first linked to prions and neurodegeneration. The precise structure of the prion is not known, though they can be formed by combining PrPC, polyadenylic acid, and lipids in a protein misfolding cyclic amplification (PMCA) reaction. Proteins showing prion-type behavior are also found in some fungi, which has been useful in helping to understand mammalian prions. Fungal prions do not appear to cause disease in their hosts. Prions cause neurodegenerative disease by aggregating extracellularly within the central nervous system to form plaques known as amyloid, which disrupt the normal tissue structure. This disruption is characterized by "holes" in the tissue with resultant spongy architecture due to the vacuole formation in the neurons. Other histological changes include astrogliosis and the absence of an inflammatory reaction. While the incubation period for prion diseases is relatively long (5 to 20 years), once symptoms appear the disease progresses rapidly, leading to brain damage and death. Neurodegenerative symptoms can include convulsions, dementia, ataxia (balance and coordination dysfunction), and behavioural or personality changes. All known prion diseases are untreatable and fatal. However, a vaccine developed in mice may provide insight into providing a vaccine to resist prion infections in humans. Additionally, in 2006 scientists announced that they had genetically engineered cattle lacking a necessary gene for prion production – thus theoretically making them immune to BSE, building on research indicating that mice lacking normally occurring prion protein are resistant to infection by scrapie prion protein. In 2013, a study revealed that 1 in 2,000 people in the United Kingdom might harbour the infectious prion protein that causes vCJD. Many different mammalian species can be affected by prion diseases, as the prion protein (PrP) is very similar in all mammals. Due to small differences in PrP between different species it is unusual for a prion disease to transmit from one species to another. 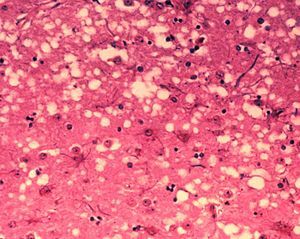 The human prion disease variant Creutzfeldt–Jakob disease, however, is thought to be caused by a prion that typically infects cattle, causing Bovine spongiform encephalopathy and is transmitted through infected meat. It has been recognized that prion diseases can arise in three different ways: acquired, familial, or sporadic. It is often assumed that the diseased form directly interacts with the normal form to make it rearrange its structure. One idea, the "Protein X" hypothesis, is that an as-yet unidentified cellular protein (Protein X) enables the conversion of PrPC to PrPSc by bringing a molecule of each of the two together into a complex. A University of California research team, led by Nobel Prize winner Stanley Prusiner, has provided evidence for the theory that infection can occur from prions in manure. And, since manure is present in many areas surrounding water reservoirs, as well as used on many crop fields, it raises the possibility of widespread transmission. It was reported in January 2011 that researchers had discovered prions spreading through airborne transmission on aerosol particles, in an animal testing experiment focusing on scrapie infection in laboratory mice. Preliminary evidence supporting the notion that prions can be transmitted through use of urine-derived human menopausal gonadotropin, administered for the treatment of infertility, was published in 2011. In 2015, researchers at The University of Texas Health Science Center at Houston found that plants can be a vector for prions. When researchers fed hamsters grass that grew on ground where a deer that died with chronic wasting disease (CWD) was buried, the hamsters became ill with CWD, suggesting that prions can bind to plants, which then take them up into the leaf and stem structure, where they can be eaten by herbivores, thus completing the cycle. It is thus possible that there is a progressively accumulating number of prions in the environment. Infectious particles possessing nucleic acid are dependent upon it to direct their continued replication. Prions, however, are infectious by their effect on normal versions of the protein. Sterilizing prions, therefore, requires the denaturation of the protein to a state in which the molecule is no longer able to induce the abnormal folding of normal proteins. In general, prions are quite resistant to proteases, heat, ionizing radiation, and formaldehyde treatments, although their infectivity can be reduced by such treatments. Effective prion decontamination relies upon protein hydrolysis or reduction or destruction of protein tertiary structure. Examples include sodium hypochlorite, sodium hydroxide, and strongly acidic detergents such as LpH. 134 °C (274 °F) for 18 minutes in a pressurized steam autoclave has been found to be somewhat effective in deactivating the agent of disease. Ozone sterilization is currently being studied as a potential method for prion denaturation and deactivation. Renaturation of a completely denatured prion to infectious status has not yet been achieved; however, partially denatured prions can be renatured to an infective status under certain artificial conditions. Immerse in 1N sodium hydroxide and place in a gravity-displacement autoclave at 121 °C for 30 minutes; clean; rinse in water; and then perform routine sterilization processes. Immerse in 1N sodium hypochlorite (20,000 parts per million available chlorine) for 1 hour; transfer instruments to water; heat in a gravity-displacement autoclave at 121 °C for 1 hour; clean; and then perform routine sterilization processes. Immerse in 1N sodium hydroxide or sodium hypochlorite (20,000 parts per million available chlorine) for 1 hour; remove and rinse in water, then transfer to an open pan and heat in a gravity-displacement (121 °C) or in a porous-load (134 °C) autoclave for 1 hour; clean; and then perform routine sterilization processes. In yeast, protein refolding to the prion configuration is assisted by chaperone proteins such as Hsp104. All known prions induce the formation of an amyloid fold, in which the protein polymerises into an aggregate consisting of tightly packed beta sheets. Amyloid aggregates are fibrils, growing at their ends, and replicate when breakage causes two growing ends to become four growing ends. The incubation period of prion diseases is determined by the exponential growth rate associated with prion replication, which is a balance between the linear growth and the breakage of aggregates. Fungal proteins exhibiting templated conformational change[further explanation needed] were discovered in the yeast Saccharomyces cerevisiae by Reed Wickner in the early 1990s. For their mechanistic similarity to mammalian prions, they were termed yeast prions. Subsequent to this, a prion has also been found in the fungus Podospora anserina. These prions behave similarly to PrP, but, in general, are nontoxic to their hosts. Susan Lindquist's group at the Whitehead Institute has argued some of the fungal prions are not associated with any disease state, but may have a useful role; however, researchers at the NIH have also provided arguments suggesting that fungal prions could be considered a diseased state. There is mounting evidence that fungal proteins have evolved specific functions that are beneficial to the microorganism that enhance their ability to adapt to their diverse environments. As of 2012[update], there are eight known prion proteins in fungi, seven in Saccharomyces cerevisiae (Sup35, Rnq1, Ure2, Swi1, Mot3, Cyc8, and Mod5) and one in Podospora anserina (HET-s). [contradictory] The article that reported the discovery of a prion form, the Mca1 protein, was retracted due to the fact that the data could not be reproduced. Notably, most of the fungal prions are based on glutamine/asparagine-rich sequences, with the exception of HET-s and Mod5. Research into fungal prions has given strong support to the protein-only concept, since purified protein extracted from cells with a prion state has been demonstrated to convert the normal form of the protein into a misfolded form in vitro, and in the process, preserve the information corresponding to different strains of the prion state. It has also shed some light on prion domains, which are regions in a protein that promote the conversion into a prion. Fungal prions have helped to suggest mechanisms of conversion that may apply to all prions, though fungal prions appear distinct from infectious mammalian prions in the lack of cofactor required for propagation. The characteristic prion domains may vary between species – e.g., characteristic fungal prion domains are not found in mammalian prions. Advancements in computer modeling have allowed scientists to identify compounds that can treat prion-caused diseases, such as one compound found to bind a cavity in the PrPC and stabilize the conformation, reducing the amount of harmful PrPSc. Antiprion antibodies capable of crossing the blood-brain-barrier and targeting cytosolic prion protein (an otherwise major obstacle in prion therapeutics) have been described. In the last decade, some progress dealing with ultra-high-pressure inactivation of prion infectivity in processed meat has been reported. In 2011, it was discovered that prions could be degraded by lichens. Astemizole has been found to have anti-prion activity. Another type of chemical that may be effective against prion infection is the luminescent conjugated polythiophenes, fluorescent compounds that are often used to stain tissue samples. In a 2015 study, led by Adriano Aguzzi, professor of neurobiology at the University of Zurich, found that when they injected mice with a prion disease and then with polythiophenes, the mice survived eighty percent longer than the control mice that were only injected with the prion disease. There continues to be a very practical problem with diagnosis of prion diseases, including BSE and CJD. They have an incubation period of months to decades, during which there are no symptoms, even though the pathway of converting the normal brain PrP protein into the toxic, disease-related PrPSc form has started. At present, there is virtually no way to detect PrPSc reliably except by examining the brain using neuropathological and immunohistochemical methods after death. Accumulation of the abnormally folded PrPSc form of the PrP protein is a characteristic of the disease, but it is present at very low levels in easily accessible body fluids like blood or urine. Researchers have tried to develop methods to measure PrPSc, but there are still no fully accepted methods for use in materials such as blood. In 2010, a team from New York described detection of PrPSc even when initially present at only one part in a hundred billion (10−11) in brain tissue. The method combines amplification with a novel technology called Surround Optical Fiber Immunoassay (SOFIA) and some specific antibodies against PrPSc. After amplifying and then concentrating any PrPSc, the samples are labelled with a fluorescent dye using an antibody for specificity and then finally loaded into a micro-capillary tube. This tube is placed in a specially constructed apparatus so that it is totally surrounded by optical fibres to capture all light emitted once the dye is excited using a laser. The RT-QuIC assay, a microplate reader-based prion detection method which uses as reagents normally folded prions, fluorescently labelled so that they "light up" when they are misfolded; samples suspected of containing misfolded prions are added and misfolded reagents can be detected by standard fluorescence detection methods. The Center for Disease Control and Prevention includes a positive RT-QuIC result in its diagnostic criteria for the probable diagnosis of sCJD. A 2015 study found that a naturally occurring variant of the human prion protein in transgenic mice protected them against kuru and CJD. The cause of the transmissible spongiform encephalopathies (TSE) is currently unknown, but the diseases are known to be associated with prions. Whether prions cause TSEs or are the result of infection with another agent such as a virus is a matter of debate by a minority of scientists. The following are some hypotheses. The prion hypothesis states that the main component of the TSE agent is composed of a misfolded protein. The Prion hypothesis can be divided into two subhypotheses: the protein-only hypothesis, and the multi-component hypothesis. Prior to the discovery of prions, it was thought that all pathogens used nucleic acids to direct their replication. The "protein-only hypothesis" states that a protein structure can replicate without the use of nucleic acids. This was initially controversial as it contradicts the central dogma of molecular biology, which describes nucleic acid as the central form of replicative information. Infectivity titre in TSEs roughly correlates with prion amyloid (PrPSc) titre, however, prion amyloid is undetectable in approximately 10% of CJD cases. No virus particles, bacteria, or fungi have been conclusively associated with prion diseases, although virus-like particles and Spiroplasma-like inclusions can be detected in some TSE cases, but not in controls (uninfected individuals). No nucleic acid has been conclusively associated with infectivity; agent is resistant to ultraviolet radiation and nucleases, although in 2016, studies have suggested that the agent can be destroyed by nucleases under certain situations and that part of the resistance to nucleases and radiation may be that byproducts from degenerating neurons may help protect a nucleic acid. No immune or inflammatory response to infection. PrPSc experimentally transmitted between one species and another results in PrPSc with the amino-acid sequence of the recipient species, suggesting that nucleic acid-mediated replication of the donor agent does not occur. Familial prion disease occurs in families with a mutation in the PrP gene, and mice with PrP mutations develop prion disease despite controlled conditions where transmission is prevented. These mice can then transmit the disease to healthy, wild type mice, suggesting that mice with PrP mutations spontaneously generate infectivity. Animals lacking PrPC do not contract prion disease. A gene for the normal protein has been identified: the PRNP gene. In all inherited cases of prion disease, there is a mutation in the PRNP gene. Many different PRNP mutations have been identified and these proteins are more likely to fold into abnormal prion. Although this discovery puts a hole in the general prion hypothesis, that prions can aggregate only proteins of identical amino acid make-up. These mutations can occur throughout the gene. Some mutations involve expansion of the octapeptide repeat region at the N-terminal of PrP. Other mutations that have been identified as a cause of inherited prion disease occur at positions 102, 117 & 198 (GSS), 200, 210 & 232 (CJD) and 178 (Fatal Familial Insomnia, FFI). The cause of prion disease can be sporadic, genetic, or infectious, or a combination of these factors. For example, to have scrapie, both an infectious agent and a susceptible genotype must be present. Despite much effort, significant titers of prion infectivity have never been produced by refolding pure PrP molecules, raising doubt about the validity of the protein-only hypothesis. In addition, the protein-only hypothesis fails to provide a molecular explanation for the ability of prion strains to target specific areas of the brain in distinct patterns. These shortcomings, along with additional experimental data, have given rise to the "multi-component" or "cofactor variation" hypothesis. In 2007, biochemist Surachai Supattapone and his colleagues at Dartmouth College produced purified infectious prions de novo from defined components (PrPC, co-purified lipids, and a synthetic polyanionic molecule). These researchers also showed that the polyanionic molecule required for prion formation was selectively incorporated into high-affinity complexes with PrP molecules, leading them to hypothesize that infectious prions may be composed of multiple host components, including PrP, lipid, and polyanionic molecules, rather than PrPSc alone. In 2010, Jiyan Ma and colleagues at the Ohio State University produced infectious prions from a recipe of bacterially expressed recombinant PrP, POPG phospholipid, and RNA, further supporting the multi-component hypothesis. This finding is in contrast to studies that found minimally infectious prions produced from recombinant PrP alone. In 2012, Supattapone and colleagues purified the membrane lipid phosphatidylethanolamine as a solitary endogenous cofactor capable of facilitating the formation of high-titer recombinant prions derived from multiple prion strains. They also reported that the cofactor is essential for maintaining the infectious conformation of PrPSc, and that cofactor molecules dictate the strain properties of infectious prions. Several different types of PrPSc occur in the brains of animals with scrapie. As PrPSc consist only of peptides, there is no known mechanism by which different prion types can occur. The mechanism by which the number of PrPSc molecules increases by orders-of-magnitude remains unexplained. There has been no satisfactory explanation as to how prion peptides with the same amino acid sequence change their 3-dimensional folding structure from an alpha helix to a beta sheet. The presence of damaged neurologic tissue is consistent with other hypotheses besides a prion. Inexplicably, mice with severe combined immunodeficiency do not develop scrapie following inoculation with brain tissue from animals infected with scrapie. Whether prions cause disease or are merely a symptom resulting from a different agent is still a matter of debate and research. The following sections describe several hypotheses: some pertain to the composition of the infectious agent (protein-only, protein with other components, virus, or other), while others pertain to its mechanism of reproduction. Reports suggest that imbalance of brain metal homeostasis may be a cause of PrPSc-associated neurotoxicity, though the underlying mechanisms are difficult to explain based on existing information. Proposed hypotheses include a functional role for PrPC in metal metabolism, and loss of this function due to aggregation to the disease-associated PrPSc form as the cause of brain metal imbalance. Other views suggest gain of toxic function by PrPSc due to sequestration of PrPC-associated metals within the aggregates, resulting in the generation of redox-active PrPSc complexes. The physiological implications of some PrPC-metal interactions are known, while others are still unclear. The pathological implications of PrPC-metal interaction include metal-induced oxidative damage, and in some instances conversion of PrPC to a PrPSc-like form. The protein-only hypothesis has been criticised by those maintaining that the simplest explanation of the evidence to date is viral. For more than a decade, Yale University neuropathologist Laura Manuelidis has been proposing that prion diseases are caused instead by an unidentified slow virus. In January 2007, she and her colleagues published an article reporting to have found a virus in 10%, or less, of their scrapie-infected cells in culture. In 2016, Sotirios Botsios and Laura Manuelidis showed evidence that TSE specific nucleic acids may be required for infectious transmission of CJD and Scrapie. Viral-like particles that do not appear to be composed of PrP have been found in some of the cells of scrapie- or CJD-infected cell lines. Many viruses, including HIV which needs CD4 and CXCR4, need a receptor to attach to and enter into host cells. The host prion, PrPc may be a receptor protein for an as yet undiscovered TSE virus, explaining why animals lacking host prion do not become infected with experimental prion disease. A prion-like protein, called MAVS, has been shown to misfold as part of the innate immune response against pathogenic viruses, similarly the cellular prion, PrPC has been shown to have anti HIV properties, and it is hypothesized that the misfolding of the prion in TSEs may be an antiviral response against an unknown virus. In 2016, studies have demonstrated susceptibility to nucleases under certain situations: >99% of infectivity was destroyed, but there was no reduction of prion protein, suggesting the presence of a nucleic acid. Studies propagating TSE infectivity in cell-free reactions and in purified component chemical reactions is thought to strongly suggest against TSE viral nature. However, some viruses, such as Poliovirus, have the ability to replicate in cell-free reactions. The 'virino hypothesis' postulates that the TSE agent is a foreign, self replicating nucleic acid or nucleic acid fragment bound to PrP. Spiroplasma is a cell wall–deficient bacterium related to Mycoplasma, which some think may be the cause of the TSEs. The lack of a cell wall means it is not susceptible to conventional antibiotics such as penicillin, which target cell wall synthesis. Frank O. Bastian of Louisiana State University first discovered Spiroplasma-like inclusions in the brain of a CJD patient during an autopsy in 1979 and has hypothesized that this bacterium could possibly be the cause of the TSEs. However, as of 2015[update], with the exception of Spiroplasma mirum strain SMCA causing spongiform microcystic encephalitis in suckling rats, other researchers have been unable to duplicate these findings, casting doubt on the Spiroplasma hypothesis. In defense of the Spiroplasma hypothesis, Bastian pointed out that Spiroplasma is hard to culture and that strain variation makes it hard to detect certain strains using PCR and other techniques, thus giving a false negative. Acinetobacter is a bacterium which some think is the cause of the TSEs. Mainly because some CJD patients produce antibodies against Acinetobacter calcoaceticus. Prion-like domains have been found in a variety of other mammalian proteins. Some of these proteins have been implicated in the ontogeny of age-related neurodegenerative disorders such as amyotrophic lateral sclerosis (ALS) a motor neuron disease, frontotemporal lobar degeneration with ubiquitin-positive inclusions (FTLD-U), Alzheimer's disease and Parkinson's disease, and Huntington's disease. They are also implicated in some forms of systemic amyloidosis including AA amyloidosis that develops in humans and animals with inflammatory and infectious diseases such as tuberculosis, Crohn's disease, rheumatoid arthritis, and HIV AIDS. AA amyloidosis, like prion disease, may be transmissible. This has given rise to the 'prion paradigm', where otherwise harmless proteins can be converted to a pathogenic form by a small number of misfolded, nucleating proteins. The definition of a prion-like domain arises from the study of fungal prions. In yeast, prionogenic proteins have a portable prion domain that is both necessary and sufficient for self-templating and protein aggregation. This has been shown by attaching the prion domain to a reporter protein, which then aggregates like a known prion. Similarly, removing the prion domain from a fungal prion protein inhibits prionogenesis. This modular view of prion behaviour has led to the hypothesis that similar prion domains are present in animal proteins, in addition to PrP. These fungal prion domains have several characteristic sequence features. They are typically enriched in asparagine, glutamine, tyrosine and glycine residues, with an asparagine bias being particularly conducive to the aggregative property of prions. Historically, prionogenesis has been seen as independent of sequence and only dependent on relative residue content. However, this has been shown to be false, with the spacing of prolines and charged residues having been shown to be critical in amyloid formation. Bioinformatic screens have predicted that over 250 human proteins contain prion-like domains (PrLD). These domains are hypothesized to have the same transmissible, amyloidogenic properties of PrP and known fungal proteins. As in yeast, proteins involved in gene expression and RNA binding seem to be particularly enriched in PrLD's, compared to other classes of protein. In particular, 29 of the known 210 proteins with an RNA recognition motif also have a putative prion domain. Meanwhile, several of these RNA-binding proteins have been independently identified as pathogenic in cases of ALS, FTLD-U, Alzheimer's disease, and Huntington's disease. The pathogenicity of prions and proteins with prion-like domains is hypothesized to arise from their self-templating ability and the resulting exponential growth of amyloid fibrils. The presence of amyloid fibrils in patients with degenerative diseases has been well documented. These amyloid fibrils are seen as the result of pathogenic proteins that self-propagate and form highly stable, non-functional aggregates. While this does not necessarily imply a causal relationship between amyloid and degenerative diseases, the toxicity of certain amyloid forms and the overproduction of amyloid in familial cases of degenerative disorders supports the idea that amyloid formation is generally toxic. Specifically, aggregation of TDP-43, an RNA-binding protein, has been found in ALS/MND patients, and mutations in the genes coding for these proteins have been identified in familial cases of ALS/MND. These mutations promote the misfolding of the proteins into a prion-like conformation. The misfolded form of TDP-43 forms cytoplasmic inclusions in afflicted neurons, and is found depleted in the nucleus. In addition to ALS/MND and FTLD-U, TDP-43 pathology is a feature of many cases of Alzheimer's disease, Parkinson's disease and Huntington's disease. The misfolding of TDP-43 is largely directed by its prion-like domain. This domain is inherently prone to misfolding, while pathological mutations in TDP-43 have been found to increase this propensity to misfold, explaining the presence of these mutations in familial cases of ALS/MND. As in yeast, the prion-like domain of TDP-43 has been shown to be both necessary and sufficient for protein misfolding and aggregation. Similarly, pathogenic mutations have been identified in the prion-like domains of heterogeneous nuclear riboproteins hnRNPA2B1 and hnRNPA1 in familial cases of muscle, brain, bone and motor neuron degeneration. The wild-type form of all of these proteins show a tendency to self-assemble into amyloid fibrils, while the pathogenic mutations exacerbate this behaviour and lead to excess accumulation. The word prion, coined in 1982 by Stanley B. Prusiner, is a portmanteau derived from protein and infection, hence prion, and is short for "proteinaceous infectious particle", in reference to its ability to self-propagate and transmit its conformation to other proteins. Its main pronunciation is /ˈpriːɒn/ ( listen), although /ˈpraɪɒn/, as the homographic name of the bird is pronounced, is also heard. In his 1982 paper introducing the term, Prusiner specified that it be "pronounced pree-on." ^ "Prion diseases". Diseases and conditions. National Institute of Health. ^ a b "Prion diseases". United States Centers for Disease Control and Prevention. ^ "What Is a Prion?". Scientific American. Retrieved 15 May 2018. ^ "Prion infectious agent". Encyclopaedia Britannica. Retrieved 15 May 2018. ^ Prusiner SB (June 1991). "Molecular biology of prion diseases". Science. 252 (5012): 1515–22. Bibcode:1991Sci...252.1515P. doi:10.1126/science.1675487. PMID 1675487. ^ Prusiner SB (November 1998). "Prions". Proceedings of the National Academy of Sciences of the United States of America. 95 (23): 13363–83. Bibcode:1998PNAS...9513363P. doi:10.1073/pnas.95.23.13363. PMC 33918. PMID 9811807. ^ a b c Prusiner SB, Woerman AL, Mordes DA, Watts JC, Rampersaud R, Berry DB, Patel S, Oehler A, Lowe JK, Kravitz SN, Geschwind DH, Glidden DV, Halliday GM, Middleton LT, Gentleman SM, Grinberg LT, Giles K (September 2015). "Evidence for α-synuclein prions causing multiple system atrophy in humans with parkinsonism". Proceedings of the National Academy of Sciences of the United States of America. 112 (38): E5308–17. Bibcode:2015PNAS..112E5308P. doi:10.1073/pnas.1514475112. PMC 4586853. PMID 26324905. Lay summary – Scientific American (September 1, 2015). ^ a b Olanow, CW; Brundin, P (January 2013). "Parkinson's disease and alpha synuclein: is Parkinson's disease a prion-like disorder?". Movement disorders : official journal of the Movement Disorder Society. 28 (1): 31–40. doi:10.1002/mds.25373. PMID 23390095. ^ a b Goedert, M (7 August 2015). "NEURODEGENERATION. Alzheimer's and Parkinson's diseases: The prion concept in relation to assembled Aβ, tau, and α-synuclein". Science. 349 (6248): 1255555. doi:10.1126/science.1255555. PMID 26250687. ^ a b Alberti S, Halfmann R, King O, Kapila A, Lindquist S (2009). "A systematic survey identifies prions and illuminates sequence features of prionogenic proteins". Cell. 137 (1): 146–58. doi:10.1016/j.cell.2009.02.044. PMC 2683788. PMID 19345193. ^ a b Aguzzi A (January 2008). "Unraveling prion strains with cell biology and organic chemistry". Proceedings of the National Academy of Sciences of the United States of America. 105 (1): 11–2. Bibcode:2008PNAS..105...11A. doi:10.1073/pnas.0710824105. PMC 2224168. PMID 18172195. ^ Supattapone, Surachai. "Synthesis of high titer infectious prions with cofactor molecules." Journal of Biological Chemistry 289, no. 29 (2014): 19850–54. ^ Mabbott, Neil A, James D Alibhai, and Jean Manson. "The role of the immune system in prion infection." Handbook of Clinical Neurology 153 (2018): 85–107. ^ a b Botsios, Sotirios, and Laura Manuelidis. "CJD and Scrapie Require Agent‐Associated Nucleic Acids for Infection." Journal of Cellular Biochemistry 117, no. 8 (2016): 1947–58. ^ a b c Miyazawa K, Kipkorir T, Tittman S, Manuelidis L (2012). "Continuous production of prions after infectious particles are eliminated: implications for Alzheimer's disease". PLOS One. 7 (4): e35471. Bibcode:2012PLoSO...735471M. doi:10.1371/journal.pone.0035471. PMC 3324552. PMID 22509412. ^ Dobson CM (February 2001). "The structural basis of protein folding and its links with human disease". Philosophical Transactions of the Royal Society of London. Series B, Biological Sciences. 356 (1406): 133–45. doi:10.1098/rstb.2000.0758. PMC 1088418. PMID 11260793. ^ Li J, Browning S, Mahal SP, Oelschlegel AM, Weissmann C (February 2010). "Darwinian evolution of prions in cell culture". Science. 327 (5967): 869–72. Bibcode:2010Sci...327..869L. doi:10.1126/science.1183218. PMC 2848070. PMID 20044542. Lay summary – BBC News (January 1, 2010). ^ Alper T, Cramp WA, Haig DA, Clarke MC (May 1967). "Does the agent of scrapie replicate without nucleic acid?". Nature. 214 (5090): 764–66. Bibcode:1967Natur.214..764A. doi:10.1038/214764a0. PMID 4963878. ^ Griffith JS (September 1967). "Self-replication and scrapie". Nature. 215 (5105): 1043–44. Bibcode:1967Natur.215.1043G. doi:10.1038/2151043a0. PMID 4964084. ^ Field EJ (September 1966). "Transmission experiments with multiple sclerosis: an interim report". British Medical Journal. 2 (5513): 564–65. doi:10.1136/bmj.2.5513.564. PMC 1943767. PMID 5950508. ^ Adams DH, Field EJ (September 1968). "The infective process in scrapie". Lancet. 2 (7570): 714–6. doi:10.1016/s0140-6736(68)90754-x. PMID 4175093. ^ Field EJ, Farmer F, Caspary EA, Joyce G (April 1969). "Susceptibility of scrapie agent to ionizing radiation". Nature. 5188. 222 (5188): 90–91. Bibcode:1969Natur.222...90F. doi:10.1038/222090a0. PMID 4975649. ^ Crick F (August 1970). "Central dogma of molecular biology". Nature. 227 (5258): 561–63. Bibcode:1970Natur.227..561C. doi:10.1038/227561a0. PMID 4913914. ^ Taubes G (December 1986). "The game of name is fame. But is it science?". Discover. 7 (12): 28–41. ^ a b Prusiner SB (April 1982). "Novel proteinaceous infectious particles cause scrapie". Science. 216 (4542): 136–44. Bibcode:1982Sci...216..136P. doi:10.1126/science.6801762. PMID 6801762. ^ "The Nobel Prize in Physiology or Medicine, 1997". NobelPrize.org. Retrieved 2010-02-28. ^ Priola SA, Chesebro B, Caughey B (May 2003). "Biomedicine. A view from the top – prion diseases from 10,000 feet". Science. 300 (5621): 917–19. doi:10.1126/science.1085920. PMID 12738843. ^ Hegde RS, Mastrianni JA, Scott MR, DeFea KA, Tremblay P, Torchia M, DeArmond SJ, Prusiner SB, Lingappa VR (February 1998). "A transmembrane form of the prion protein in neurodegenerative disease". Science. 279 (5352): 827–34. Bibcode:1998Sci...279..827H. doi:10.1126/science.279.5352.827. PMID 9452375. ^ a b c Krull IS, Nunnally BK (2004). Prions and mad cow disease. New York: Marcel Dekker. p. 6. ISBN 0824740831. ^ Brown DR, Qin K, Herms JW, Madlung A, Manson J, Strome R, Fraser PE, Kruck T, von Bohlen A, Schulz-Schaeffer W, Giese A, Westaway D, Kretzschmar H (1997). "The cellular prion protein binds copper in vivo". Nature. 390 (6661): 684–87. Bibcode:1997Natur.390..684B. doi:10.1038/37783. PMID 9414160. ^ Weissmann C (November 2004). "The state of the prion". Nature Reviews. Microbiology. 2 (11): 861–71. doi:10.1038/nrmicro1025. PMID 15494743. ^ Málaga-Trillo E, Solis GP, Schrock Y, Geiss C, Luncz L, Thomanetz V, Stuermer CA (March 2009). Weissmann C (ed.). "Regulation of embryonic cell adhesion by the prion protein". PLoS Biology. 7 (3): e55. doi:10.1371/journal.pbio.1000055. PMC 2653553. PMID 19278297. ^ Saborio GP, Permanne B, Soto C (June 2001). "Sensitive detection of pathological prion protein by cyclic amplification of protein misfolding". Nature. 411 (6839): 810–13. doi:10.1038/35081095. PMID 11459061. ^ Bieschke J, Weber P, Sarafoff N, Beekes M, Giese A, Kretzschmar H (August 2004). "Autocatalytic self-propagation of misfolded prion protein". Proceedings of the National Academy of Sciences of the United States of America. 101 (33): 12207–11. Bibcode:2004PNAS..10112207B. doi:10.1073/pnas.0404650101. PMC 514458. PMID 15297610. ^ Pan KM, Baldwin M, Nguyen J, Gasset M, Serban A, Groth D, Mehlhorn I, Huang Z, Fletterick RJ, Cohen FE (December 1993). "Conversion of alpha-helices into beta-sheets features in the formation of the scrapie prion proteins". Proceedings of the National Academy of Sciences of the United States of America. 90 (23): 10962–66. Bibcode:1993PNAS...9010962P. doi:10.1073/pnas.90.23.10962. PMC 47901. PMID 7902575. ^ a b c Baker HF, Ridley RM (1996). Prion Disease. New Jersey: Humana Press. ISBN 0896033422. ^ Abbott A (2010-01-24). "Healthy prions protect nerves". Nature. doi:10.1038/news.2010.29. ^ Nailwal H, Chan FK (2018-07-06). "Necroptosis in anti-viral inflammation". Nature. ^ Shorter J, Lindquist S (June 2005). "Prions as adaptive conduits of memory and inheritance". Nature Reviews. Genetics. 6 (6): 435–50. doi:10.1038/nrg1616. PMID 15931169. ^ Maglio LE, Perez MF, Martins VR, Brentani RR, Ramirez OA (November 2004). "Hippocampal synaptic plasticity in mice devoid of cellular prion protein". Brain Research. Molecular Brain Research. 131 (1–2): 58–64. doi:10.1016/j.molbrainres.2004.08.004. PMID 15530652. ^ Caiati MD, Safiulina VF, Fattorini G, Sivakumaran S, Legname G, Cherubini E (February 2013). "PrPC controls via protein kinase A the direction of synaptic plasticity in the immature hippocampus". The Journal of Neuroscience. 33 (7): 2973–83. doi:10.1523/JNEUROSCI.4149-12.2013. PMID 23407955. ^ Sudhakarana IP, Ramaswamia M (2016-10-11). "Long-term memory consolidation: The role of RNA-binding proteins with prion-like domains". ^ Zhang CC, Steele AD, Lindquist S, Lodish HF (February 2006). "Prion protein is expressed on long-term repopulating hematopoietic stem cells and is important for their self-renewal". Proceedings of the National Academy of Sciences of the United States of America. 103 (7): 2184–89. Bibcode:2006PNAS..103.2184Z. doi:10.1073/pnas.0510577103. PMC 1413720. PMID 16467153. ^ Cohen FE, Pan KM, Huang Z, Baldwin M, Fletterick RJ, Prusiner SB (April 1994). "Structural clues to prion replication". Science. 264 (5158): 530–31. Bibcode:1994Sci...264..530C. doi:10.1126/science.7909169. PMID 7909169. ^ Eigen M (December 1996). "Prionics or the kinetic basis of prion diseases". Biophysical Chemistry. 63 (1): A1–18. doi:10.1016/S0301-4622(96)02250-8. PMID 8981746. ^ Bolton DC, Rudelli RD, Currie JR, Bendheim PE (December 1991). "Copurification of Sp33-37 and scrapie agent from hamster brain prior to detectable histopathology and clinical disease". The Journal of General Virology. 72 ( Pt 12) (12): 2905–13. doi:10.1099/0022-1317-72-12-2905. PMID 1684986. ^ Jendroska K, Heinzel FP, Torchia M, Stowring L, Kretzschmar HA, Kon A, Stern A, Prusiner SB, DeArmond SJ (September 1991). "Proteinase-resistant prion protein accumulation in Syrian hamster brain correlates with regional pathology and scrapie infectivity". Neurology. 41 (9): 1482–90. doi:10.1212/WNL.41.9.1482. PMID 1679911. ^ Beekes M, Baldauf E, Diringer H (August 1996). "Sequential appearance and accumulation of pathognomonic markers in the central nervous system of hamsters orally infected with scrapie". The Journal of General Virology. 77 ( Pt 8) (8): 1925–34. doi:10.1099/0022-1317-77-8-1925. PMID 8760444. ^ Bamborough P, Wille H, Telling GC, Yehiely F, Prusiner SB, Cohen FE (1996). "Prion protein structure and scrapie replication: theoretical, spectroscopic, and genetic investigations". Cold Spring Harbor Symposia on Quantitative Biology. 61: 495–509. doi:10.1101/SQB.1996.061.01.050. PMID 9246476. ^ a b c d Masel J, Jansen VA, Nowak MA (March 1999). "Quantifying the kinetic parameters of prion replication". Biophysical Chemistry. 77 (2–3): 139–52. doi:10.1016/S0301-4622(99)00016-2. PMID 10326247. ^ Knowles TP, Waudby CA, Devlin GL, Cohen SI, Aguzzi A, Vendruscolo M, Terentjev EM, Welland ME, Dobson CM (December 2009). "An analytical solution to the kinetics of breakable filament assembly". Science. 326 (5959): 1533–37. Bibcode:2009Sci...326.1533K. doi:10.1126/science.1178250. PMID 20007899. ^ Masel J, Jansen VA (December 2000). "Designing drugs to stop the formation of prion aggregates and other amyloids". Biophysical Chemistry. 88 (1–3): 47–59. doi:10.1016/S0301-4622(00)00197-6. PMID 11152275. ^ a b c d e f g h i "90. Prions". ICTVdB Index of Viruses. U.S. National Institutes of Health website. 2002-02-14. Retrieved 2010-02-28. ^ Babelhadj B, Di Bari MA, Pirisinu L, Chiappini B, Gaouar SB, Riccardi G, Marcon S, Agrimi U, Nonno R, Vaccari G (June 2018). "Prion Disease in Dromedary Camels, Algeria". Emerging Infectious Diseases. 24 (6): 1029–36. doi:10.3201/eid2406.172007. PMID 29652245. ^ Hussein MF, Al-Mufarrej SI (2004). "Prion Diseases: A Review; II. Prion Diseases in Man and Animals" (PDF). Scientific Journal of King Faisal University (Basic and Applied Sciences). 5 (2): 139. Retrieved April 9, 2016. ^ Mastrianni JA, Nixon R, Layzer R, Telling GC, Han D, DeArmond SJ, Prusiner SB (May 1999). "Prion protein conformation in a patient with sporadic fatal insomnia". The New England Journal of Medicine. 340 (21): 1630–38. doi:10.1056/NEJM199905273402104. PMID 10341275. Lay summary – BBC News (May 28, 1999). ^ Nitrini R, Rosemberg S, Passos-Bueno MR, da Silva LS, Iughetti P, Papadopoulos M, Carrilho PM, Caramelli P, Albrecht S, Zatz M, LeBlanc A (August 1997). "Familial spongiform encephalopathy associated with a novel prion protein gene mutation". Annals of Neurology. 42 (2): 138–46. doi:10.1002/ana.410420203. PMID 9266722. ^ Laurén J, Gimbel DA, Nygaard HB, Gilbert JW, Strittmatter SM (February 2009). "Cellular prion protein mediates impairment of synaptic plasticity by amyloid-beta oligomers". Nature. 457 (7233): 1128–32. Bibcode:2009Natur.457.1128L. doi:10.1038/nature07761. PMC 2748841. PMID 19242475. ^ a b c Deleault NR, Harris BT, Rees JR, Supattapone S (June 2007). "Formation of native prions from minimal components in vitro". Proceedings of the National Academy of Sciences of the United States of America. 104 (23): 9741–46. Bibcode:2007PNAS..104.9741D. doi:10.1073/pnas.0702662104. PMC 1887554. PMID 17535913. ^ Lindquist S, Krobitsch S, Li L, Sondheimer N (February 2001). "Investigating protein conformation-based inheritance and disease in yeast". Philosophical Transactions of the Royal Society of London. Series B, Biological Sciences. 356 (1406): 169–76. doi:10.1098/rstb.2000.0762. PMC 1088422. PMID 11260797. ^ Robbins SL, Cotran RS, Kumar V, et al., eds. (1999). Robbins pathologic basis of disease. Philadelphia: Saunders. ISBN 072167335X. ^ Belay ED (1999). "Transmissible spongiform encephalopathies in humans". Annual Review of Microbiology. 53: 283–314. doi:10.1146/annurev.micro.53.1.283. PMID 10547693. ^ "Prion Diseases". US Centers for Disease Control. 2006-01-26. Archived from the original on 2010-03-04. Retrieved 2010-02-28. ^ Gilch S, Winklhofer KF, Groschup MH, Nunziante M, Lucassen R, Spielhaupter C, Muranyi W, Riesner D, Tatzelt J, Schätzl HM (August 2001). "Intracellular re-routing of prion protein prevents propagation of PrP(Sc) and delays onset of prion disease". The EMBO Journal. 20 (15): 3957–66. doi:10.1093/emboj/20.15.3957. PMC 149175. PMID 11483499. ^ Goñi F, Knudsen E, Schreiber F, Scholtzova H, Pankiewicz J, Carp R, Meeker HC, Rubenstein R, Brown DR, Sy MS, Chabalgoity JA, Sigurdsson EM, Wisniewski T (2005). "Mucosal vaccination delays or prevents prion infection via an oral route". Neuroscience. 133 (2): 413–21. doi:10.1016/j.neuroscience.2005.02.031. PMID 15878645. Lay summary – ScienceDaily (May 14, 2005). ^ Weiss R (2007-01-01). "Scientists Announce Mad Cow Breakthrough". The Washington Post. Retrieved 2010-02-28. Scientists said yesterday that they have used genetic engineering techniques to produce the first cattle that may be biologically incapable of getting mad cow disease. ^ Gill ON, Spencer Y, Richard-Loendt A, Kelly C, Dabaghian R, Boyes L, Linehan J, Simmons M, Webb P, Bellerby P, Andrews N, Hilton DA, Ironside JW, Beck J, Poulter M, Mead S, Brandner S (October 2013). "Prevalent abnormal prion protein in human appendixes after bovine spongiform encephalopathy epizootic: large scale survey". BMJ. 347: f5675. doi:10.1136/bmj.f5675. PMC 3805509. PMID 24129059. ^ Collinge J (2001). "Prion diseases of humans and animals: their causes and molecular basis". Annual Review of Neuroscience. 24: 519–50. doi:10.1146/annurev.neuro.24.1.519. PMID 11283320. ^ Ironside JW (March 2006). "Variant Creutzfeldt–Jakob disease: risk of transmission by blood transfusion and blood therapies". Haemophilia. 12 Suppl 1: 8–15, discussion 26–28. doi:10.1111/j.1365-2516.2006.01195.x. PMID 16445812. ^ Groschup MH, Kretzschmar HA, eds. (2001). Prion Diseases Diagnosis and Pathogeneis. Archives of Virology. Suppl 16. New York: Springer. ISBN 978-3211835302. ^ Telling GC, Scott M, Mastrianni J, Gabizon R, Torchia M, Cohen FE, DeArmond SJ, Prusiner SB (October 1995). "Prion propagation in mice expressing human and chimeric PrP transgenes implicates the interaction of cellular PrP with another protein". Cell. 83 (1): 79–90. doi:10.1016/0092-8674(95)90236-8. PMID 7553876. ^ Johnson CJ, Pedersen JA, Chappell RJ, McKenzie D, Aiken JM (July 2007). "Oral transmissibility of prion disease is enhanced by binding to soil particles". PLoS Pathogens. 3 (7): e93. doi:10.1371/journal.ppat.0030093. PMC 1904474. PMID 17616973. ^ Tamgüney G, Miller MW, Wolfe LL, Sirochman TM, Glidden DV, Palmer C, Lemus A, DeArmond SJ, Prusiner SB (September 2009). "Asymptomatic deer excrete infectious prions in faeces". Nature. 461 (7263): 529–32. Bibcode:2009Natur.461..529T. doi:10.1038/nature08289. PMC 3186440. PMID 19741608. ^ Haybaeck J, Heikenwalder M, Klevenz B, Schwarz P, Margalith I, Bridel C, Mertz K, Zirdum E, Petsch B, Fuchs TJ, Stitz L, Aguzzi A (January 2011). "Aerosols transmit prions to immunocompetent and immunodeficient mice". PLoS Pathogens. 7 (1): e1001257. doi:10.1371/journal.ppat.1001257. PMC 3020930. PMID 21249178. Lay summary – New Scientist (January 13, 2011). ^ Van Dorsselaer A, Carapito C, Delalande F, Schaeffer-Reiss C, Thierse D, Diemer H, McNair DS, Krewski D, Cashman NR (March 2011). "Detection of prion protein in urine-derived injectable fertility products by a targeted proteomic approach". PLOS One. 6 (3): e17815. Bibcode:2011PLoSO...617815V. doi:10.1371/journal.pone.0017815. PMC 3063168. PMID 21448279. ^ Beecher, Coockson (June 1, 2015). "Surprising' Discovery Made About Chronic Wasting Disease". Food Safety News. Retrieved 2016-04-08. ^ Pritzkow S, Morales R, Moda F, Khan U, Telling GC, Hoover E, Soto C (May 2015). "Grass plants bind, retain, uptake, and transport infectious prions". Cell Reports. 11 (8): 1168–75. doi:10.1016/j.celrep.2015.04.036. PMC 4449294. PMID 25981035. ^ Qin K, O'Donnell M, Zhao RY (August 2006). "Doppel: more rival than double to prion". Neuroscience. 141 (1): 1–8. doi:10.1016/j.neuroscience.2006.04.057. PMID 16781817. ^ Race RE, Raymond GJ (February 2004). "Inactivation of transmissible spongiform encephalopathy (prion) agents by environ LpH". Journal of Virology. 78 (4): 2164–65. doi:10.1128/JVI.78.4.2164-2165.2004. PMC 369477. PMID 14747583. ^ Collins SJ, Lawson VA, Masters CL (January 2004). "Transmissible spongiform encephalopathies". Lancet. 363 (9402): 51–61. doi:10.1016/S0140-6736(03)15171-9. PMID 14723996. ^ Brown P, Rau EH, Johnson BK, Bacote AE, Gibbs CJ, Gajdusek DC (March 2000). "New studies on the heat resistance of hamster-adapted scrapie agent: threshold survival after ashing at 600 degrees C suggests an inorganic template of replication". Proceedings of the National Academy of Sciences of the United States of America. 97 (7): 3418–21. Bibcode:2000PNAS...97.3418B. doi:10.1073/pnas.050566797. PMC 16254. PMID 10716712. ^ "Ozone Sterilization". UK Health Protection Agency. 2005-04-14. Archived from the original on February 10, 2007. Retrieved 2010-02-28. ^ Weissmann C, Enari M, Klöhn PC, Rossi D, Flechsig E (December 2002). "Transmission of prions". Proceedings of the National Academy of Sciences of the United States of America. 99 Suppl 4 (90004): 16378–83. Bibcode:2002PNAS...9916378W. doi:10.1073/pnas.172403799. PMC 139897. PMID 12181490. ^ Sutton JM, Dickinson J, Walker JT, Raven ND (September 2006). "Methods to minimize the risks of Creutzfeldt–Jakob disease transmission by surgical procedures: where to set the standard?". Clinical Infectious Diseases. 43 (6): 757–64. doi:10.1086/507030. PMID 16912952. ^ Dong J, Bloom JD, Goncharov V, Chattopadhyay M, Millhauser GL, Lynn DG, Scheibel T, Lindquist S (November 2007). "Probing the role of PrP repeats in conformational conversion and amyloid assembly of chimeric yeast prions". The Journal of Biological Chemistry. 282 (47): 34204–12. doi:10.1074/jbc.M704952200. PMC 2262835. PMID 17893150. ^ Newby GA, Lindquist S (June 2013). "Blessings in disguise: biological benefits of prion-like mechanisms". Trends in Cell Biology. 23 (6): 251–59. doi:10.1016/j.tcb.2013.01.007. PMID 23485338. ^ Nemecek J, Nakayashiki T, Wickner RB (June 2011). "Retraction for Nemecek et al. : A prion of yeast metacaspase homolog (Mca1p) detected by a genetic screen". Proceedings of the National Academy of Sciences of the United States of America. 108 (24): 10022. doi:10.1073/pnas.1107490108. PMC 3116407. PMID 21628591. ^ Rogoza T, Goginashvili A, Rodionova S, Ivanov M, Viktorovskaya O, Rubel A, Volkov K, Mironova L (June 2010). "Non-Mendelian determinant [ISP+] in yeast is a nuclear-residing prion form of the global transcriptional regulator Sfp1". Proceedings of the National Academy of Sciences of the United States of America. 107 (23): 10573–77. Bibcode:2010PNAS..10710573R. doi:10.1073/pnas.1005949107. PMC 2890785. PMID 20498075. ^ Kuwata K, Nishida N, Matsumoto T, Kamatari YO, Hosokawa-Muto J, Kodama K, Nakamura HK, Kimura K, Kawasaki M, Takakura Y, Shirabe S, Takata J, Kataoka Y, Katamine S (July 2007). "Hot spots in prion protein for pathogenic conversion". Proceedings of the National Academy of Sciences of the United States of America. 104 (29): 11921–26. Bibcode:2007PNAS..10411921K. doi:10.1073/pnas.0702671104. PMC 1924567. PMID 17616582. ^ Jones DR, Taylor WA, Bate C, David M, Tayebi M (March 2010). Ma J (ed.). "A camelid anti-PrP antibody abrogates PrP replication in prion-permissive neuroblastoma cell lines". PLOS One. 5 (3): e9804. Bibcode:2010PLoSO...5.9804J. doi:10.1371/journal.pone.0009804. PMC 2842437. PMID 20339552. ^ Brown P, Meyer R, Cardone F, Pocchiari M (May 2003). "Ultra-high-pressure inactivation of prion infectivity in processed meat: a practical method to prevent human infection". Proceedings of the National Academy of Sciences of the United States of America. 100 (10): 6093–97. Bibcode:2003PNAS..100.6093B. doi:10.1073/pnas.1031826100. PMC 156331. PMID 12732724. ^ Johnson CJ, Bennett JP, Biro SM, Duque-Velasquez JC, Rodriguez CM, Bessen RA, Rocke TE (May 2011). "Degradation of the disease-associated prion protein by a serine protease from lichens". PLOS One. 6 (5): e19836. Bibcode:2011PLoSO...619836J. doi:10.1371/journal.pone.0019836. PMC 3092769. PMID 21589935. Lay summary – Scientific American (May 19, 2011). ^ Karapetyan YE, Sferrazza GF, Zhou M, Ottenberg G, Spicer T, Chase P, Fallahi M, Hodder P, Weissmann C, Lasmézas CI (April 2013). "Unique drug screening approach for prion diseases identifies tacrolimus and astemizole as antiprion agents". Proceedings of the National Academy of Sciences of the United States of America. 110 (17): 7044–49. Bibcode:2013PNAS..110.7044K. doi:10.1073/pnas.1303510110. PMC 3637718. PMID 23576755. Lay summary – The Scripps Research Institute (April 3, 2013). ^ Herrmann US, Schütz AK, Shirani H, Huang D, Saban D, Nuvolone M, Li B, Ballmer B, Åslund AK, Mason JJ, Rushing E, Budka H, Nyström S, Hammarström P, Böckmann A, Caflisch A, Meier BH, Nilsson KP, Hornemann S, Aguzzi A (August 2015). "Structure-based drug design identifies polythiophenes as antiprion compounds". Science Translational Medicine. 7 (299): 299ra123. doi:10.1126/scitranslmed.aab1923. PMID 26246168. Lay summary – Live Science (August 5, 2015). ^ Castilla J, Saá P, Soto C (September 2005). "Detection of prions in blood". Nature Medicine. 11 (9): 982–85. doi:10.1038/nm1286. PMID 16127436. ^ Chang B, Gray P, Piltch M, Bulgin MS, Sorensen-Melson S, Miller MW, Davies P, Brown DR, Coughlin DR, Rubenstein R (July 2009). "Surround optical fiber immunoassay (SOFIA): an ultra-sensitive assay for prion protein detection". Journal of Virological Methods. 159 (1): 15–22. doi:10.1016/j.jviromet.2009.02.019. PMID 19442839. ^ Haley NJ, Hoover EA (2015). "Chronic wasting disease of cervids: current knowledge and future perspectives". Annual Review of Animal Biosciences. 3: 305–25. doi:10.1146/annurev-animal-022114-111001. PMID 25387112. ^ Atarashi R, Satoh K, Sano K, Fuse T, Yamaguchi N, Ishibashi D, Matsubara T, Nakagaki T, Yamanaka H, Shirabe S, Yamada M, Mizusawa H, Kitamoto T, Klug G, McGlade A, Collins SJ, Nishida N (February 2011). "Ultrasensitive human prion detection in cerebrospinal fluid by real-time quaking-induced conversion" (PDF). Nature Medicine. 17 (2): 175–78. doi:10.1038/nm.2294. PMID 21278748. ^ Orrú CD, Bongianni M, Tonoli G, Ferrari S, Hughson AG, Groveman BR, Fiorini M, Pocchiari M, Monaco S, Caughey B, Zanusso G (August 2014). "A test for Creutzfeldt–Jakob disease using nasal brushings". The New England Journal of Medicine. 371 (6): 519–29. doi:10.1056/NEJMoa1315200. PMC 4186748. PMID 25099576. ^ Emmanuel A Asante; et al. (June 10, 2015). "A naturally occurring variant of the human prion protein completely prevents prion disease". Nature. 522: 478–81. doi:10.1038/nature14510. PMC 4486072. ^ a b Bastian F (3 August 2014). "Striking a Nerve: Prions Not the Last Word in TSEs". MedPageToday. ^ a b c Manuelidis L (July 2013). "Infectious particles, stress, and induced prion amyloids: a unifying perspective". Virulence. 4 (5): 373–83. doi:10.4161/viru.24838. PMC 3714129. PMID 23633671. ^ a b Bastian FO (December 1979). "Spiroplasma-like inclusions in Creutzfeldt–Jakob disease". Archives of Pathology & Laboratory Medicine. 103 (13): 665–69. PMID 389196. ^ a b Botsios S, Manuelidis L (August 2016). "CJD and Scrapie Require Agent-Associated Nucleic Acids for Infection". Journal of Cellular Biochemistry. 117 (8): 1947–58. doi:10.1002/jcb.25495. PMID 26773845. ^ Okamoto M, Furuoka H, Horiuchi M, Noguchi T, Hagiwara K, Muramatsu Y, Tomonaga K, Tsuji M, Ishihara C, Ikuta K, Taniyama H (November 2003). "Experimental transmission of abnormal prion protein (PrPsc) in the small intestinal epithelial cells of neonatal mice". Veterinary Pathology. 40 (6): 723–27. doi:10.1354/vp.40-6-723. PMID 14608031. Replication of the PrPsc depends critically on the host normal prion protein (PrPc), which develops into an abnormal, detergent-insoluble, proteinase-resistant isoform, PrPsc, in affected tissues such as the central nervous system (CNS) and lymphoid tissues. ^ Oesch B, Westaway D, Wälchli M, McKinley MP, Kent SB, Aebersold R, Barry RA, Tempst P, Teplow DB, Hood LE (April 1985). "A cellular gene encodes scrapie PrP 27-30 protein". Cell. 40 (4): 735–46. doi:10.1016/0092-8674(85)90333-2. PMID 2859120. ^ a b Goldmann W (2008). "PrP genetics in ruminant transmissible spongiform encephalopathies". Veterinary Research. 39 (4): 30. doi:10.1051/vetres:2008010. PMID 18284908. ^ Geissen M, Krasemann S, Matschke J, Glatzel M (July 2007). "Understanding the natural variability of prion diseases". Vaccine. 25 (30): 5631–36. doi:10.1016/j.vaccine.2007.02.041. PMID 17391814. ^ Supattapone S (February 2010). "Biochemistry. What makes a prion infectious?". Science. 327 (5969): 1091–2. doi:10.1126/science.1187790. PMID 20185716. ^ Geoghegan JC, Valdes PA, Orem NR, Deleault NR, Williamson RA, Harris BT, Supattapone S (December 2007). "Selective incorporation of polyanionic molecules into hamster prions". The Journal of Biological Chemistry. 282 (50): 36341–53. doi:10.1074/jbc.M704447200. PMC 3091164. PMID 17940287. ^ Wang F, Wang X, Yuan CG, Ma J (February 2010). "Generating a prion with bacterially expressed recombinant prion protein". Science. 327 (5969): 1132–35. Bibcode:2010Sci...327.1132W. doi:10.1126/science.1183748. PMC 2893558. PMID 20110469. ^ Legname G, Baskakov IV, Nguyen HO, Riesner D, Cohen FE, DeArmond SJ, Prusiner SB (July 2004). "Synthetic mammalian prions". Science. 305 (5684): 673–76. Bibcode:2004Sci...305..673L. doi:10.1126/science.1100195. PMID 15286374. ^ Makarava N, Kovacs GG, Bocharova O, Savtchenko R, Alexeeva I, Budka H, Rohwer RG, Baskakov IV (February 2010). "Recombinant prion protein induces a new transmissible prion disease in wild-type animals". Acta Neuropathologica. 119 (2): 177–87. doi:10.1007/s00401-009-0633-x. PMC 2808531. PMID 20052481. ^ Deleault NR, Piro JR, Walsh DJ, Wang F, Ma J, Geoghegan JC, Supattapone S (May 2012). "Isolation of phosphatidylethanolamine as a solitary cofactor for prion formation in the absence of nucleic acids". Proceedings of the National Academy of Sciences of the United States of America. 109 (22): 8546–51. Bibcode:2012PNAS..109.8546D. doi:10.1073/pnas.1204498109. PMC 3365173. PMID 22586108. ^ Deleault NR, Walsh DJ, Piro JR, Wang F, Wang X, Ma J, Rees JR, Supattapone S (July 2012). "Cofactor molecules maintain infectious conformation and restrict strain properties in purified prions". Proceedings of the National Academy of Sciences of the United States of America. 109 (28): E1938–46. Bibcode:2012PNAS..109E1938D. doi:10.1073/pnas.1206999109. PMC 3396481. PMID 22711839. ^ Ebringer, Alan. "Bovine Spongiform Encephalopathy: Comparison Between the 'Prion' Hypothesis and the Autoimmune Theory." In Multiple Sclerosis, Mad Cow Disease and Acinetobacter, pp. 27–35. Springer, Cham, 2015. ^ Singh N, Das D, Singh A, Mohan ML (2010). "Prion Protein and Metal Interaction: Physiological and Pathological Implications". In Tatzelt J (ed.). The Prion Protein. Savanna Press. ISBN 978-0954333522. ^ Manuelidis L (March 2007). "A 25 nm virion is the likely cause of transmissible spongiform encephalopathies". Journal of Cellular Biochemistry. 100 (4): 897–915. doi:10.1002/jcb.21090. PMID 17044041. ^ "Pathogenic Virus Found in Mad Cow Cells". Yale. 2007-02-02. Archived from the original on May 3, 2012. Retrieved 2010-02-28. ^ a b Manuelidis L, Yu ZX, Barquero N, Banquero N, Mullins B (February 2007). "Cells infected with scrapie and Creutzfeldt–Jakob disease agents produce intracellular 25-nm virus-like particles". Proceedings of the National Academy of Sciences of the United States of America. 104 (6): 1965–70. Bibcode:2007PNAS..104.1965M. doi:10.1073/pnas.0610999104. PMC 1794316. PMID 17267596. ^ Hou F, Sun L, Zheng H, Skaug B, Jiang QX, Chen ZJ (August 2011). "MAVS forms functional prion-like aggregates to activate and propagate antiviral innate immune response". Cell. 146 (3): 448–61. doi:10.1016/j.cell.2011.06.041. PMC 3179916. PMID 21782231. ^ Xu H, He X, Zheng H, Huang LJ, Hou F, Yu Z, de la Cruz MJ, Borkowski B, Zhang X, Chen ZJ, Jiang QX (January 2014). "Structural basis for the prion-like MAVS filaments in antiviral innate immunity". eLife. 3: e01489. doi:10.7554/eLife.01489. PMC 3932521. PMID 24569476. ^ Alais S, Soto-Rifo R, Balter V, Gruffat H, Manet E, Schaeffer L, Darlix JL, Cimarelli A, Raposo G, Ohlmann T, Leblanc P (April 2012). "Functional mechanisms of the cellular prion protein (PrP(C)) associated anti-HIV-1 properties". Cellular and Molecular Life Sciences. 69 (8): 1331–52. doi:10.1007/s00018-011-0879-z. PMID 22076653. ^ Castilla J, Saá P, Hetz C, Soto C (April 2005). "In vitro generation of infectious scrapie prions". Cell. 121 (2): 195–206. doi:10.1016/j.cell.2005.02.011. PMID 15851027. ^ Karapetyan YE (February 2012). "Viruses do replicate in cell-free systems". Proceedings of the National Academy of Sciences of the United States of America. 109 (8): E461, author reply E462. Bibcode:2012PNAS..109E.461K. doi:10.1073/pnas.1118908109. PMC 3286940. PMID 22308429. ^ Franco D, Pathak HB, Cameron CE, Rombaut B, Wimmer E, Paul AV (May 2005). "Stimulation of poliovirus synthesis in a HeLa cell-free in vitro translation-RNA replication system by viral protein 3CDpro". Journal of Virology. 79 (10): 6358–67. doi:10.1128/JVI.79.10.6358-6367.2005. PMC 1091690. PMID 15858019. ^ Dickinson, AG; Outram, GW (1988). "Genetic aspects of unconventional virus infections: the basis of the virino hypothesis". In Bock, Greg; Marsh, Joan (eds.). Novel Infectious Agents and the Central Nervous System. Ciba Foundation Symposium. 135. pp. 63–83. doi:10.1002/9780470513613.ch5. ISBN 978-0470513620. PMID 3044709. ^ Simoneau S, Thomzig A, Ruchoux MM, Vignier N, Daus ML, Poleggi A, Lebon P, Freire S, Durand V, Graziano S, Galeno R, Cardone F, Comoy E, Pocchiari M, Beekes M, Deslys JP, Fournier JG (2015). "Synthetic scrapie infectivity: interaction between recombinant PrP and scrapie brain-derived RNA". Virulence. 6 (2): 132–44. doi:10.4161/21505594.2014.989795. PMC 4601501. PMID 25585171. ^ Bastian FO, Jennings RA, Gardner WA (December 1987). "Antiserum to scrapie-associated fibril protein cross-reacts with Spiroplasma mirum fibril proteins". Journal of Clinical Microbiology. 25 (12): 2430–31. PMC 269511. PMID 2892856. ^ Bastian FO, Foster JW (June 2001). "Spiroplasma sp. 16S rDNA in Creutzfeldt–Jakob disease and scrapie as shown by PCR and DNA sequence analysis". Journal of Neuropathology and Experimental Neurology. 60 (6): 613–20. doi:10.1093/jnen/60.6.613. PMID 11398837. ^ Alexeeva I, Elliott EJ, Rollins S, Gasparich GE, Lazar J, Rohwer RG (January 2006). "Absence of Spiroplasma or other bacterial 16s rRNA genes in brain tissue of hamsters with scrapie". Journal of Clinical Microbiology. 44 (1): 91–97. doi:10.1128/JCM.44.1.91-97.2006. PMC 1351941. PMID 16390954. ^ Leach RH, Matthews WB, Will R (June 1983). "Creutzfeldt–Jakob disease. Failure to detect spiroplasmas by cultivation and serological tests" (PDF). Journal of the Neurological Sciences. 59 (3): 349–53. doi:10.1016/0022-510x(83)90020-5. PMID 6348215. ^ Hamir AN, Greenlee JJ, Stanton TB, Smith JD, Doucette S, Kunkle RA, Stasko JA, Richt JA, Kehrli ME (January 2011). "Experimental inoculation of raccoons (Procyon lotor) with Spiroplasma mirum and transmissible mink encephalopathy (TME)". Canadian Journal of Veterinary Research. 75 (1): 18–24. PMC 3003558. PMID 21461191. ^ Tiwana H, Wilson C, Pirt J, Cartmell W, Ebringer A (December 1999). "Autoantibodies to brain components and antibodies to Acinetobacter calcoaceticus are present in bovine spongiform encephalopathy". Infection and Immunity. 67 (12): 6591–95. PMC 97071. PMID 10569779. ^ Longkumer T, Kamireddy S, Muthyala VR, Akbarpasha S, Pitchika GK, Kodetham G, Ayaluru M, Siddavattam D (2013). "Acinetobacter phage genome is similar to Sphinx 2.36, the circular DNA copurified with TSE infected particles". Scientific Reports. 3: 2240. Bibcode:2013NatSR...3E2240L. doi:10.1038/srep02240. PMC 3715749. PMID 23867905. ^ a b c King OD, Gitler AD, Shorter J (June 2012). "The tip of the iceberg: RNA-binding proteins with prion-like domains in neurodegenerative disease". Brain Research. 1462: 61–80. doi:10.1016/j.brainres.2012.01.016. PMC 3372647. PMID 22445064. ^ Murakami T, Ishiguro N, Higuchi K (March 2014). "Transmission of systemic AA amyloidosis in animals". Veterinary Pathology. 51 (2): 363–71. doi:10.1177/0300985813511128. PMID 24280941. ^ Jucker M, Walker LC (September 2013). "Self-propagation of pathogenic protein aggregates in neurodegenerative diseases". Nature. 501 (7465): 45–51. Bibcode:2013Natur.501...45J. doi:10.1038/nature12481. PMC 3963807. PMID 24005412. ^ a b Eisenberg D, Jucker M (March 2012). "The amyloid state of proteins in human diseases". Cell. 148 (6): 1188–203. doi:10.1016/j.cell.2012.02.022. PMC 3353745. PMID 22424229. ^ Kim HJ, Kim NC, Wang YD, Scarborough EA, Moore J, Diaz Z, MacLea KS, Freibaum B, Li S, Molliex A, Kanagaraj AP, Carter R, Boylan KB, Wojtas AM, Rademakers R, Pinkus JL, Greenberg SA, Trojanowski JQ, Traynor BJ, Smith BN, Topp S, Gkazi AS, Miller J, Shaw CE, Kottlors M, Kirschner J, Pestronk A, Li YR, Ford AF, Gitler AD, Benatar M, King OD, Kimonis VE, Ross ED, Weihl CC, Shorter J, Taylor JP (March 2013). "Mutations in prion-like domains in hnRNPA2B1 and hnRNPA1 cause multisystem proteinopathy and ALS". Nature. 495 (7442): 467–73. Bibcode:2013Natur.495..467K. doi:10.1038/nature11922. PMC 3756911. PMID 23455423. ^ "Stanley B. Prusiner – Autobiography". NobelPrize.org. Retrieved 2007-01-02. ^ Schonberger LB, Schonberger RB (June 2012). "Etymologia: prion". Emerging Infectious Diseases. 18 (6): 1030–31. doi:10.3201/eid1806.120271. PMC 3381685. PMID 22607731. The Family That Couldn't Sleep by D.T. Max. ISBN 978-0812972528. provides a history of prion diseases. Brown P, Cervenakova L (2005). "A prion lexicon (out of control)". The Lancet. 365 (9454): 122. doi:10.1016/S0140-6736(05)17700-9. Kraus A, Groveman BR, Caughey B (2013). "Prions and the potential transmissibility of protein misfolding diseases". Annual Review of Microbiology. 67: 543–64. doi:10.1146/annurev-micro-092412-155735. PMC 4784231. PMID 23808331.